« Made it to Anuradhapura! Today we took a tour of the ancient city of Anuradhapura by tuk tuk. 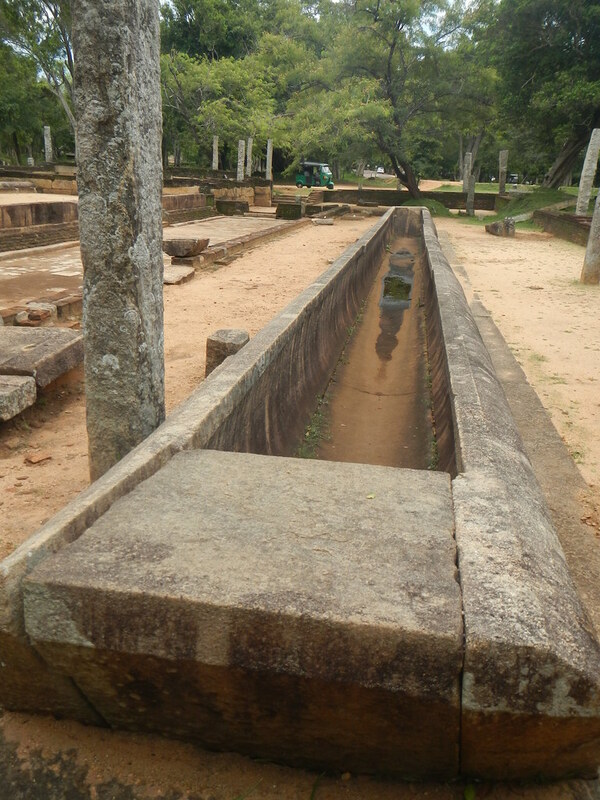 The history of Anuradhapura dates back to around 450 BC and there was a lot going on! This was a huge centre of Buddhism with large monasteries and other necessary infrastructure such as reservoirs (called tanks) built to accommodate and service thousands of monks. The ruins of the monasteries are extensive and have interesting features such as the stone troughs that were filled with food to feed the monks in a refectory style set up. The most astounding sights here are the stupas, also called dagobas. There are many of them, several monumental in size. Our guide assisted us to purchase the necessary tickets and gave us useful explanations of the different sites. The Abaygiri Dagoba, built in red brick, was neglected for many years and became covered in vegetation before being renovated. 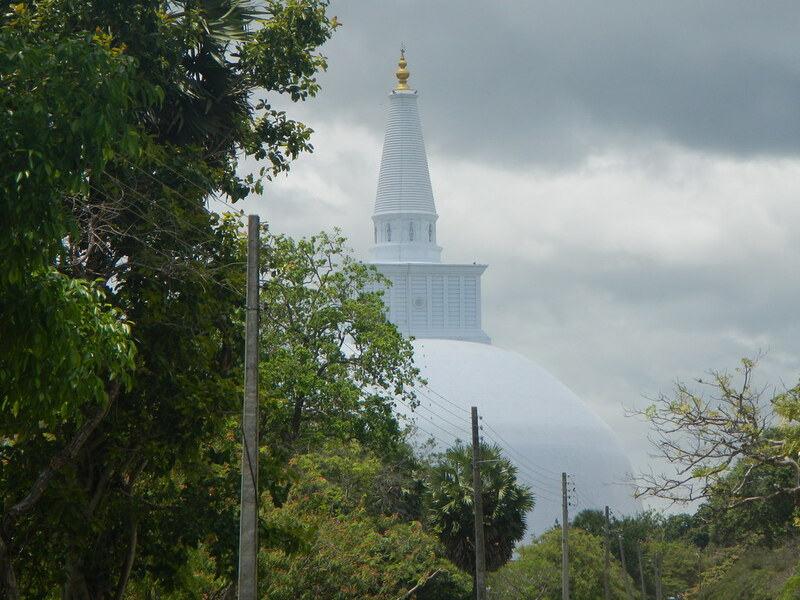 The Ruwanwelisiya Dagoba is immense with a huge bright white dome and gold topped spire and an elephant frieze on the surrounding walls. We spoke to a couple of similar vintage to ourselves with loaded touring bikes. They are from Arnhem in The Netherlands and are spending 4 weeks cycling here. Our tour ended with a delicious lunch of red rice, various fish and vegetable curries and coconut sambal, total $3.60. On another topic: animals. There are many (too many) dogs in Sri Lanka. They all look like undernourished dingoes and choose to sleep or stand on the roadway, apparently oblivious to traffic. Only a couple have bothered to chase us. 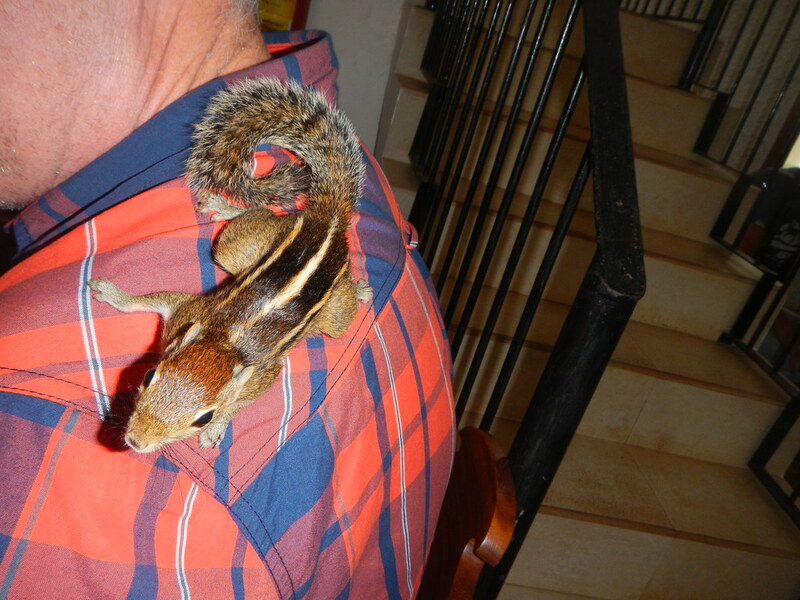 In Negombo we saw tiny palm squirrels scampering up the walls, and here in Anuradhapura our hosts at Villu Villa have one as a pet. It visited us this morning at breakfast and climbed over Ian’s back and shoulders in a friendly way. We have seen what appear to be mongooses running across the road, but not sure what they are. Chirping geckoes are common. We have seen our first monkeys here. So far no elephants. This entry was posted on 11 September 2015 at 11:09 am and is filed under Sri Lanka. You can follow any responses to this entry through the RSS 2.0 feed. You can leave a response, or trackback from your own site.